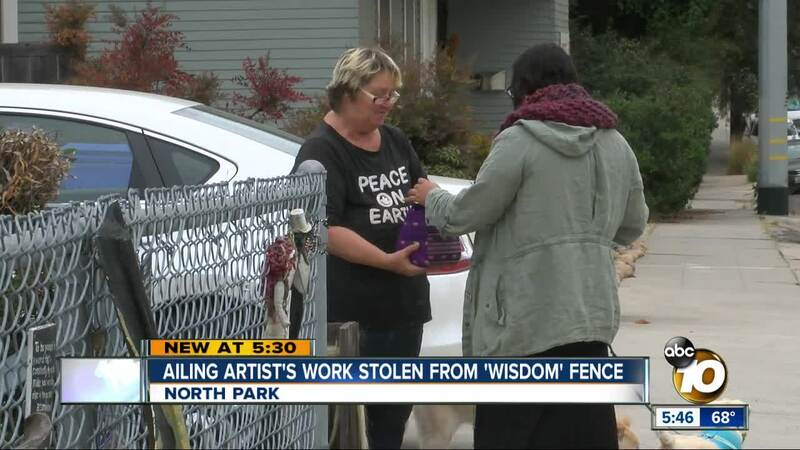 SAN DIEGO (KGTV) - An ailing artist is pleading for the return of one of her final pieces of work, after it recently disappeared from a beloved 'wisdom' fence. At the corner of 32nd Street and Redwood Street is a fence that speaks volumes. "I just hope people stop by and think, and think about what's most important in life," said Carmen Costello. Costello, a self-taught artist, created a heart three years ago, mounted it on the 'wisdom' fence outside her home, and then kept adding works of art, quotes and messages meant to inspire and inspire conversation. The fence quickly became a landmark. "The neighbors stop off, offer supplies and tell me how they feel about it. There's a lot of crying and laughing," said Costello. The fence is now missing something: a white, wire-and-cloth alien that took months to make, an ode to the diversity of the universe. She put it up a few weeks ago. It was stolen on Friday afternoon. The alien was tied to the fence in 6 or 7 places with wires. The theft is especially hard to bear because Costello has been diagnosed with congestive heart failure. She believes she only has a few months to live. "This is the most likely the last installation I will be putting up here," said Costello. She's now hoping the thief will see our story and return the alien. "I would like that, yes It belongs here. It belongs to the community. It would inspiring for the them to change their mind and give it back and back to the community," said Costello. Anyone with information on the missing art, send tips to tips@10news.com.